CIO has been informed that the San Francisco Museum of Modern Art (SFMOMA) has commissioned the guerrilla art group Together We Can Defeat Capitalism (TWCDC) to paint a giant mural on the exterior wall of the future museum extension. The extension is being constructed to house the art collection of Fisher family, founders of the GAP clothing empire. It is scheduled to open in 2016. TWCDC’s design for the mural is quite simple: it is the GAP logo itself. In a brilliant conceptual twist the mural both honors GAP and the Fisher family, and at the same time presents a stunning critique of the role of wealth and privilege in the art world. Collaborations between arts organizations and corporations are nothing new of course. For some time SFMOMA has openly courted such partnerships and its website proudly declares that “recent research indicates that corporate philanthropy yields returns of 200 to 300 percent.” Existing sponsors include Wells Fargo, Google, and of course the GAP. It is illuminating to learn that the museum sees itself as an engine for the creation of capital. The piece is in the the tradition of Warhol’s simple re-presentation of popular brand names such as Campbell’s soup. Warhol’s works were displayed in museums, as a statement about the conflation of advertising and art. The TWCDC piece cloaks the museum itself in a statement about the conflation of fine art and corporate capitalism. The museum must be complimented on allowing such a statement to be made. Or, is it a savvy move by the museum, knowing that the best way to deflate a critique is to embrace it? A critic with with close ties to the the museum, speaking on condition of anonymity, stated that the public would most likely see the GAP mural as pure advertising and without any artistic merit. 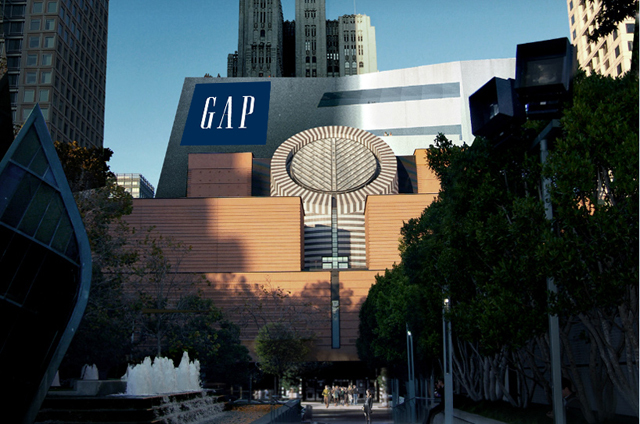 A TWCDC spokesperson explained that the term “gap” also references the gap between the old SFMOMA and the new, between the incomes of the rich and the rest of us, between institutional art and the art of the street, between oppressor and oppressed. In a nod to Matthew Barney, the mural will be painted by a single TWCDC member rappelling from the roof of the new extension. A TWCDC spokesman estimated the mural would take over a year to paint and should be considered a performance to be viewed by museum attendees and spectators in the vicinity of the museum. The method of execution also hints at that other great icon of the USA, Mount Rushmore. Painting of the mural is scheduled to start immediately after completion of the new extension. SFMOMA and GAP are also collaborating with several local artists on the design and production of custom-designed t-shirts. In a similar conceptual judo throw to the mural, TWCDCs t-shirts will be adorned simply with a silkscreened GAP logo. The t-shirts will be sold through the SFMOMA gift shop. Similar versions of the GAP logo shirt will be available at GAP stores for a fraction of the price. TWCDC’s previous exhibition at SFMOMA, ingeniously titled Together We Can Defeat Capitalism consisted simply of posters and postcards with Botta’s graphic image of the museum and the bold caption: TOGETHER WE CAN DEFEAT CAPITALISM, harking back nostalgically to an era when art was involved in fomenting real social change. TWCDC also parked an electronic traffic sign outside of SFMOMA and delivered a pertinent warning. This entry was posted in art, CAPITALISM. Bookmark the permalink.